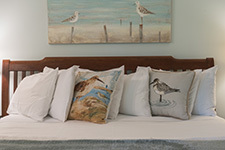 If you like birds then you will love Audubon Room. 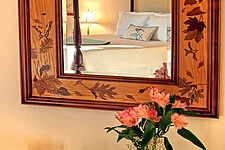 This room highlights birds in its décor – especially bluebirds, which we have nesting on our property almost year-round. There are also many wrens, warblers, juncos and mourning doves – not to mention all the cardinal pairs that feed at the feeders. The hickory trees outside are favorites of the squirrels. 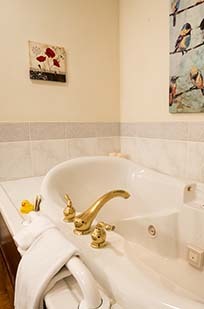 So settle back on the loveseat in front of the fire or on the spacious king bed and enjoy the show outside your window. Celebrating a special day or event? How about adding an extra special touch, such as a Celebration Cake or a Jacuzzi goodie basket and a bottle of wine and wine glasses? Check our Extra Touches page for more ideas, or make it a complete package – see our Packages and Specials page.